A federal judge barred the Labor Department from implementing a new policy that would force companies to disclose any advice they seek during union elections. Texas District Court Judge Samuel Cummings granted an injunction against the Department of Labor’s new disclosure requirements known as the Persuader Rule just days before the rule was to take effect. Previously employers were forced to disclose their use of consultants and advisers who spoke with employees about the negative effects of unionization during organizing campaigns. The Obama administration adopted a proposal in March that would force employers to make public any legal advice they sought regarding unionization regardless of whether those consultants actually interacted with employees. Judge Cummings issued a nationwide stay that will prevent the department from enforcing the rule until the court rules on the merits of the case. Cummings dismissed the rule because it violated statutory language that specifically exempted legal advice from disclosure. The court said that the case could threaten the free speech rights of employers. "The chilling of speech protected by the First Amendment is in and of itself an irreparable injury," Cummings said in an order released Monday. He added that the new rule was so vague as to make it "impossible to enforce." 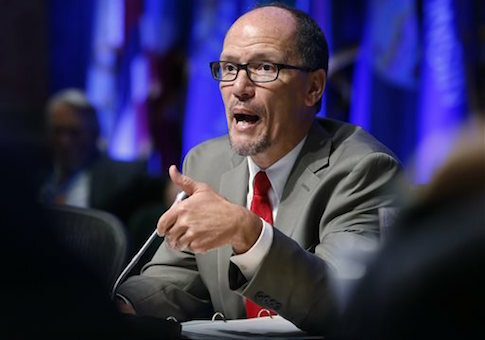 "DOL replaced a long-standing and early understandable bright-line rule with one that is vague and impossible to apply," he ruled. "There is substantial risk that associations, employers and consultants, including attorneys, will not be able to determine with reasonable certainty whether their actions require reporting." The Labor Department did not return request for comment. Three separate lawsuits have been filed against the department to block the rule. Judge Cummings’ ruling came just days after Minnesota District Court Judge Patrick Schiltz denied the request for an injunction, but concluded that the rule will not survive a judicial challenge on the merits of the case. "The Court concludes that plaintiffs are likely to succeed in their claim that portions of the new rule conflict with the LMRDA," Judge Schiltz ruled. Cummings referenced the Minnesota case in his own order. He distinguished between the matter before Texas and Minnesota by focusing on the plaintiffs. The Texas case was filed by employers, while lawyers were the plaintiffs in Minnesota. Cummings said that it was easier to prove harm done to a small businessman than the lawyers whose advice is sought. Labor lawyers said Cummings’ order foreshadows what will come when the court undertakes arguments on the merits of the case. David Phippen, a management-side labor attorney at Constangy, Brooks, Smith, & Prophete, said the department has a high bar to clear in order to sway Cummings into upholding the rule. The strong language in Cummings’ ruling indicates that the judge does not see the regulation as constitutional. "The court’s pretty much already said that this rule’s invalid," he said. "The writing’s on the wall." Roger Quillen, chairman of Fisher Phillips, said that the Judge Cummings understood the plaintiffs’ argument that the new rule threatened attorney-client privilege. Smaller businesses may eschew seeking legal advice rather than deal with union pressure campaigns. "The harm would have been severe and clearly not reparable because confidential dealings will become a matter of public record," he said. Labor critics celebrated the ruling. Heather Greenaway, spokesman for the free market Workforce Fairness Institute, said that the rule would have been a giveaway to organized labor. The vagueness of disclosure would leave companies susceptible to unfair labor practice charges. "The persuader rule is yet another example of the administration’s efforts to tip the scales in favor of union bosses and at the expense of America’s business community," she said in a release. "Chilling first amendment speech and subverting attorney-client confidentiality is unconstitutional and far exceeds the authority of the executive branch." The department can appeal the ruling. Quillen and Phippen both said they would be surprised if the department did not attempt to bring the new rule before the Supreme Court. The Department faced stark opposition from employers while it was considering the rule for a number of years and ignored thousands of critics in the legal and business communities during the rule’s public comment period. Phippen said it was an ideological, rather than a legal battle for the administration. Quill agreed. "The Department of Labor has been dogged in pursuit of this rule even in the face of massive opposition. It’s remarkable to me that they were just so undeterred," he said. "Politically speaking they’ve made the decision that is in the interest of organized labor. They’re going to fight for it." The rule was set to go into effect on Friday, but will be put on hold until the case is resolved or the judge decides to lift the injunction. This entry was posted in Issues and tagged Department of Labor. Bookmark the permalink.